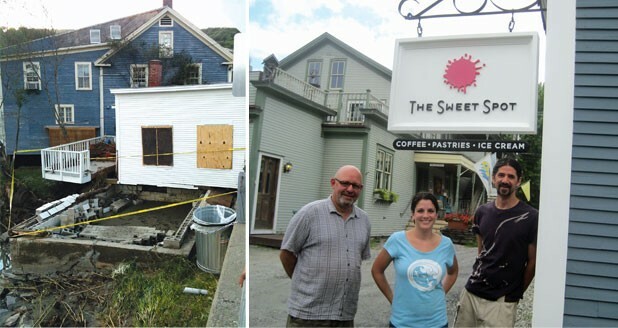 A year after Irene, how do Vermont's affected eateries and farms fare? The surreal, early-morning tableau of August 29, 2011 — mud, disaster and shocked faces throughout Vermont’s river valleys — didn’t last long. Within hours, thousands of hands busied themselves with shovels, mops, wet/dry vacs and determination. Tropical Storm Irene left a smelly mess and dealt a financial blow to farmers and restaurateurs across a wide swath of the state. Kitchen floors were slathered in muck. Walk-ins were ruined. Worktables had been tossed around like sticks. Crops of chard and onions and lettuce looked as if a giant had trampled them. Intrepid owners and legions of volunteers — with the help, in some cases, of various loans and grants — enabled many cafés, restaurants and diners to get back on their feet within weeks. Twelve months later, some are still struggling and a few are gone forever. Many restaurant owners still consider themselves in recovery mode. They hope the first anniversary will bring a sense of closure. 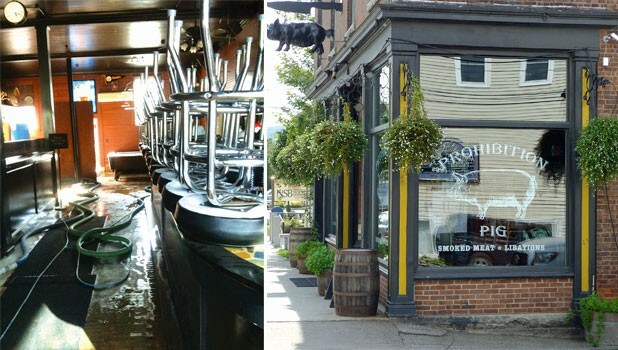 The Alchemist Pub and Brewery after the flood, and now Prohibiton Pig. In the weeks after Irene, the constant stream of trucks lumbering through Waterbury kicked up dust that the flood had left behind on the streets, giving the air a permanent haze as driveways were stacked with salvage. It was like a postwar scene, smack in the middle of Vermont. Waterbury is chockablock with food businesses, and very few were spared. Vermont Artisan Coffee & Tea Company, the Vermont Peanut Butter Company, Juniper’s Fare, Green Mountain Coffee Visitor Center & Café, the Reservoir Restaurant & Tap Room, Arvad’s Grill and Pub — all weathered various degrees of destruction. Most of them eventually recovered and reopened, though not always as expected. At the Alchemist Pub & Brewery, floodwater and mud ruined the basement brewery and so severely damaged the business that owners John and Jen Kimmich vacillated about salvaging their iconic spot. They were already poised to open their new Alchemist Cannery up the road in Waterbury Center, and they soon began shipping out shiny silver cans of Heady Topper — a beer so popular that, one year later, the brewery sporadically runs out of it. Eventually, the Kimmiches decided to focus on their new venture and not reopen their Main Street space. By coincidence, Chad Rich — at that time bar manager at the Farmhouse Tap & Grill in Burlington — was looking for a place to open his own eatery devoted to barbecue, craft beer and libations. The Alchemist space was exactly what he wanted. That winter, Rich dove into rehabbing and, by the end of March, the community’s sadness over losing the Alchemist gave way to enthusiasm for his new restaurant, Prohibition Pig. Juniper's Fare, after Irene and now. Nearby, Arvad’s took on six feet of water and hundreds of thousands of dollars’ worth of damage. Co-owner Maryanne Larkin says lunch business at the 24-year-old restaurant has not yet fully recovered, and that she’s heard owners of other businesses say they are “90 percent down.” Larkin chalks it up in part to the ongoing (and possibly permanent) closure of the state offices in town. “We’re hoping after the anniversary of the flood to be more positive, and move on,” she says. The Green Cup after Irene, and the Sweet Spot now. “That’s a whole new view,” Chris Alberti says. The chef-owner of Peasant, which will open in Waitsfield later this month, is looking out his window facing the Mad River. A year ago, Birke Photography stood next door. Now the window offers a direct view of the river that carried that building onto the roof of this one — at 40 Bridge Street — on August 28, 2011. At the time, 40 Bridge was home to the Green Cup Café. There chef-owner Jason Gulisano built a reputation for excellence with both his daytime baked goods and sandwiches and his high-end dinners. After the flood, Gulisano eventually decided to explore his passion for meat at Royal Butcher in Randolph rather than reopen his ravaged restaurant. His tight-knit Italian family made the choice to repopulate the space itself, joined by Alberti, a former Wall Street trader turned Green Cup line cook. The Gulisanos already owned the building, so parents Sam and Barbara Gulisano organized a meeting at their top-floor home to decide what would fill the vacant space. Before the flood, John Vitko, the husband of Gulisano daughter Sarina, had already planned to open a small commercial kitchen to make his Scout’s Honor artisan ice cream. He committed to becoming a tenant. The Gulisanos convinced their other daughter, Lisa Curtis, to move her planned baking business from her home in Huntington to their building. That was in April. By the end of June, the space held one dessert emporium — the Sweet Spot — housing both Scout’s Honor and Curtis’ bakery, and Sweet Simone’s, where she fills orders for the coconut cake and other pastries that made the Green Cup a destination, along with her own creations. A few take-out items are always available at the small storefront, including cookies and Montréal-style bagels. Soon the building will again house a full-service restaurant, too. Though Alberti isn’t a blood relative, he has been folded into the “interesting dynamic,” as Curtis puts it, of the Gulisano family. The fledgling restaurateur came to Vermont nine years ago, after ending a finance career shortly after walking out of his World Trade Center office just 20 minutes before the impact of American Airlines Flight 11. Alberti had long dreamed of opening a restaurant, and last year he dipped his toe into the business by working the line under Jason Gulisano. He never suspected that the kitchen would someday be his, or that the Gulisano family would be instrumental in making it happen. Early in his tenure at the Green Cup, Alberti learned that the Gulisanos had once lived two towns over from him in New Jersey, and the families had friends in common. Now Alberti, his wife, Mary Ellen, and their children consider themselves part of the extended Gulisano clan. His menu reflects that approach. Alberti says most dishes will cost between $10 and $20, including pork braciole and Tuscan meatballs in white wine and rosemary sauce. Alberti’s son, Sean, will make the fresh pasta and work as a server. Pricier specials will include what Alberti calls simply “the lamb dish” — a clay tureen filled with three tender lamb chops on a bed of caramelized onions, zucchini and sun-dried tomatoes in acidic white wine. Bar business will be a focal point. Alberti is working on a poutine recipe that will work without a deep fryer for his late-night menu. He says he’ll keep his relaxed back barroom open as late as 2 a.m. if customers demand it. Naturally, some desserts will come from the Sweet Spot, namely ice cream and gelato from Scout’s Honor. With construction on Peasant nearly complete, Vitko says the building is now 75 percent repaired. New tenants have moved into most of the office spaces, including Design Bistro, a graphic-design business co-owned by Veronica Wirth, former Green Cup pastry chef and current Sweet Simone’s employee. 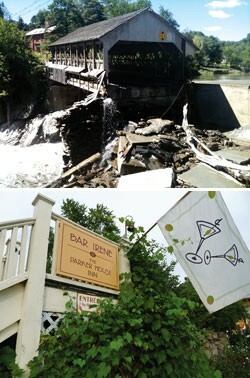 The Quechee Bridge after Irene, and the Parker House now. During Tropical Storm Irene, a pounding Ottauquechee River swept away much of Quechee’s iconic covered bridge, cutting off the older part of the village (and its businesses) from busy Route 4. On the isolated side, the river flooded the town green and Shepard’s Pie deli, swallowed the ground floor of the Parker House Inn and Bistro and destroyed the prep kitchen and glassblowing facilities of Simon Pearce. Throughout the Upper Valley, the story was the same. The 50-year-old White Cottage Snack Bar in Woodstock was leveled, and the storm rendered the Woodstock Farmers Market next door a grim, murky ruin. Roads in and around Killington were swept away, isolating residents and businesses for weeks. In Sharon, the swelling White River rose to the eaves of the 60-year-old Sandy’s Drive-In and nearby Dixies II eatery. A year later, the new normal is a solid rebuild. Sandy’s owner Sharon Aldrich rallied to resurrect her decades-old establishment: She built a new dining room, expanded her menu and added a pizza oven. The Woodstock Farmers Market relied on loans, FEMA funds and advance-pay credit cards to finance repairs, and reopened after three frenzied months. Owner John Hurley rebuilt the White Cottage, weatherizing his dining rooms. As Parker House Inn owners Alexandra and Adam La Noue-Adler mucked out, they were dealing with the concurrent loss of their nearby home — which was eventually condemned. Yet they managed to reopen with limited service a week after the storm. After powering through foliage and ski season, the La Noue-Adlers closed the inn to ruminate on their next steps. “We thought, We have to do something, and we’re not failures. We wanted to really push the envelope,” Alexandra La Noue-Adler says. One of their solutions was to redo their rooms in a modern, whimsical style. Since they rolled out the new look in May, the inn has been consistently full, she reports. But the bridge’s fall left tourists confused about how to get to the “other” side of Quechee (despite two other easy routes), and the town has felt the loss. The owners of Shepard’s Pie — a busy deli-bakery before the storm — eventually decided to close and move the business into their more formal restaurant on Route 4. Hurricane Flats, after Irene and now. Take a walk at South Royalton’s Hurricane Flats farm and fine dust will quickly coat your feet. It’s but one subtle reminder that the White River inundated this 37-acre farm last summer, devastating late-summer crops and greenhouses to the tune of more than $120,000. So why does Honigford sound upbeat? In part because this summer’s harvest is bounteous — on a recent day, the farm store is filled with onions, tomatoes, Swiss chard, radishes and melons. Looking at the riches, one would never guess that, after Irene, the hard-won organic certification of Hurricane Flats and other local organic farms seemed to hang in the balance. In the days after Irene, farmers feared that their fields could be contaminated by toxic effluent, or worse. 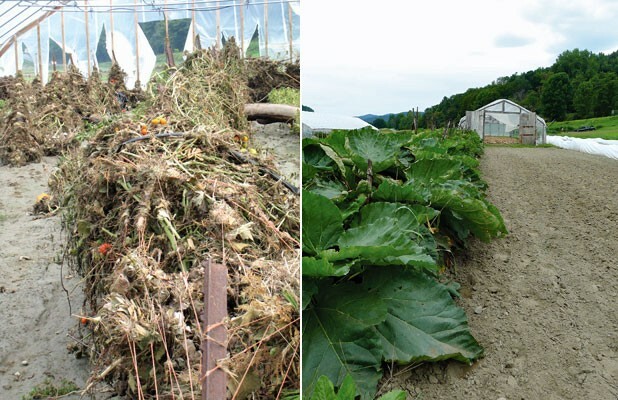 Yet, in the end, every organic farm that reported flood damage — about 112 in all — was able to keep its certification from the Northeast Organic Farming Association of Vermont. Nicole Dehne, NOFA-VT’s certification administrator, says the issue boiled down to whether the floodwaters “were considered an application of a prohibited substance” — leaving oily residue or oily silt, for instance. The farmers who reported concerns had their land tested; none showed measurable toxicity. “Which was so wonderful,” Dehne says. During this first post-Irene growing season, Honigford has mapped his land so he knows where to apply extra TLC. He fertilized to reinvigorate more barren patches, and though he’s had two plantings of corn that “didn’t go well,” he’s feeling in control. “I’ve got a pretty good grasp of what [the soil] needs, and we’ll do better next year,” he says. Honigford’s optimism is shared by Mark Fasching of Jericho Settlers Farm. On the 100-acre Richmond plot he owns with his partner, Christa Alexander, Irene ruined crops and tractors and took the lives of a few pigs and sheep, causing more than $125,000 in damage. Yet Fasching says the storm left only some debris and “a little bit of sand.” He has moved the bulk of his vegetable production to the fertile riverside plot, aware that it’s a gamble.